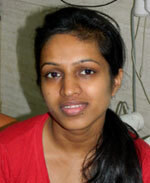 This is Jyoti from Delhi. I came here for braces treatment. As this was my first visit to dentist , I was most pleased with service and treatment found at Dr Chopra dental clinic..
Their way of treatment, polite nature of Dr. Ashish and very clear explanation about tooth problem and its cure . I got braces treatment done and it is worth spending money on teeth at this clinic. Now I have a good smile.